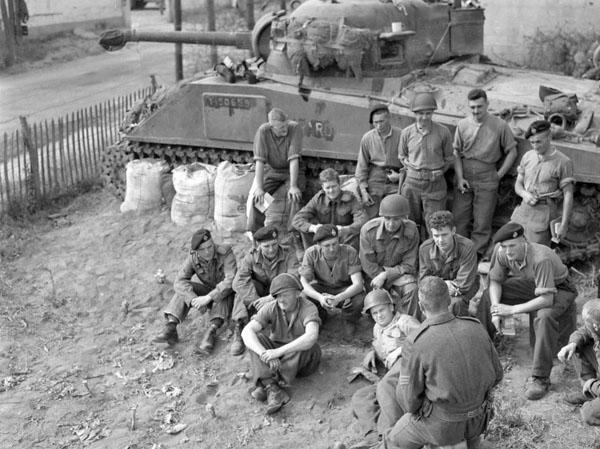 Sergeant E. Owen (foreground) conducting an Orders (O) Ggroup for personnel of No.1 Protective Troop, Headquarters Squadron, 4th Canadian Armoured Brigade, Vaucelles, France, August 7th 1944. Names in group: Troopers E.B. Dunphy and J.B. Crawford, Corporal J.A. Mead, Troopers D.J. Neal, F. Conery, H. Goldstein, R.A. Buckler, H.L. Murphy, H. McAdam, G.E. Watts, W.B. Croft, J.E. Boulet, P.A. Crawford, J.A. McDonald and A.J. Gott.